Those lovable characters of Runyonland are back in Conejo Players’ current production of “Guys and Dolls,” Jo Swerling and Abe Burrows’ musicalization of Damon Runyon’s classic literary characters: the dese-dem-dose gang of polite gamblers and their gum-chewing molls. The show includes a world-renowned score by Frank Loesser. Director John Gaston has assembled a delightful cast of chiefly familiar faces with a few casting-against-type surprises that work well within the familiar story. Generally speaking, as “Fugue for Tinhorns” goes, so does the show. The introductory song of overlapping vocals by touts Nicely Nicely Johnson, Benny Southstreet and Rusty Charlie is smoothly done by the trio played by, respectively, Gabriel Vega, Rich Grosso and Fred Kronenberg. I didn’t expect Vega to work as Nicely Nicely, who is generally lovably roly-poly, but Vega proves to be a capable singer, deft on his feet and possessing excellent comic ability. Nicely-Nicely is described as a foodie and is usually seen noshing on something or other, giving the actor playing him the opportunity for some precious little bits of business. Vega complies, snatching a stalk of celery from a Bloody Mary and chomping on it, leaves and all, and later, emerging from the wings munching on a foot-long sourdough roll. After the fugue we are introduced to Nathan Detroit, as lovable as he is slippery, who has two perpetual goals in mind: to secure a location for his floating crap game and to dodge his commitment-minded fiancee, Miss Adelaide. Kelly Green has made a career of playing Detroit and has his character down pat, using his resemblance to Jackie Gleason to the hilt. Masaya Urba delivers just about the best performance as Miss Adelaide as we have seen on any stage, stealing every scene she is in. The key to playing Adelaide is to make her real and not like the thinly drawn caricatures that work for the gamblers. Urba’s “Joizee” accent is perfect but not overdone. The little nuances she brings into her speech, her facial expressions and her adorable sneezes are exactly how we would expect Adelaide to behave. And when she has scenes with Green, it’s theater magic. It’s no coincidence that these two played opposite each other four years ago in a production at the High Street Arts Center. An interesting point about “Guys and Dolls”—you never know which scene will be the standout. In CPT’s production, watch for “Sue Me,” a relatively minor song that transitions between two bravura production numbers: the “Luck Be a Lady” gambling scene in the sewers and the pseudo-gospel shout “Sit Down, You’re Rockin’ the Boat.” The repartee between Green and Urba in this number is wonderfully funny and just touching enough to make you sympathetic toward both characters. That’s great acting. Not to be forgotten are terrific performances by Brent Ramirez as suave gambler Sky Masterson and Adelle Panico as the naive missionary Sarah Brown. Key supporting roles are well-played by Ray Mastrovito as an Irish-brogued Arvide Abernathy, Erin Fagundes as the stern General Cartwright and Dale Dale Alpert as Chicago gambler Big Jule, sporting a cigar the size of a hunk of salami. Miriam Durrie-Kirsch’s stellar choreography is highlighted by inventive production numbers for the “Havana” and “Luck Be a Lady” sequences. Beth Eslick’s fabulous costumes are a major contribution to the show’s success, outfitting the cartoonish gangsters with suits that look like they came from a plaid factory that exploded. The only flaw in the show’s look is the underwhelming set design, which fails to match the flamboyance of the costuming. Otherwise, this show rolls a seven. 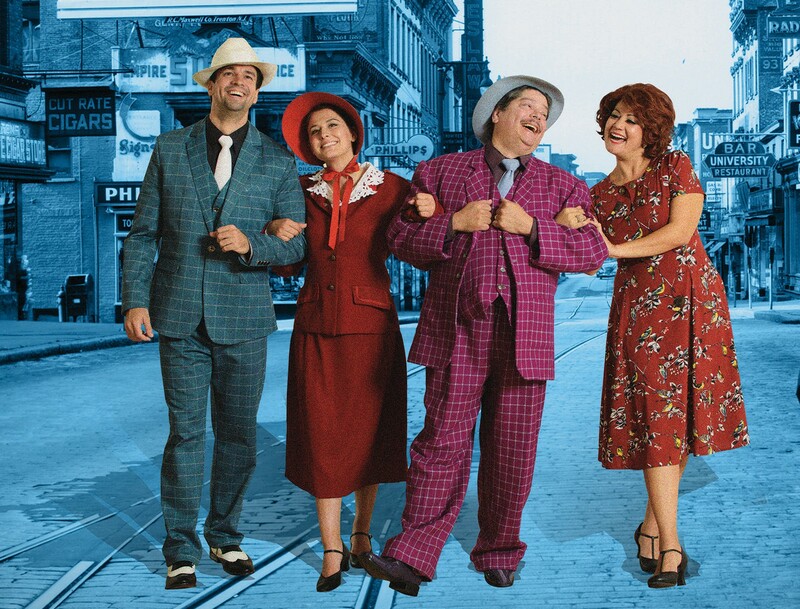 “Guys and Dolls” plays through Dec. 16 at Conejo Players Theatre, 350 S. Moorpark Road, Thousand Oaks. For tickets, visit conejoplayers.org or call (805) 495-3715.